2500 sq/ft House set in the countryside just outside Ballybunion overlooking the mouth of the Shannon estuary and the Atlantic ocean. 5 spacious bedrooms, one en-suite and one main bathroom with bath and power shower, Kitchen with all modern appliances including coffee machine and wine cooler fridge, Living room with 3 couches and solid fuel stove for the cooler evenings and a separate dining room, oil central heating and large gardens, an internal glass balcony allows the holiday maker to relax with a book while enjoying the ocean views. Sky television and basic broadband are included. for the sunny days a large patio allows the kids to run around while you relax on the garden furniture. 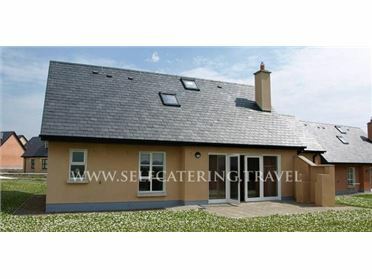 The property is adjacent to a small farm in a rural setting yet minutes from the charming bustling seaside town of Ballybunion, The town is world famous for its 2 world class golf link course's and beautiful blue flag beeches, During the season most bar's have traditional music and great food on offer. Heating is an oil fired boiler. A standard oil and electricity allowance is included in your rental rate, however excessive use of either will be deducted from your deposit. Bed Linen & towels are included also. *Glenachoor house is strictly Non Smoking.